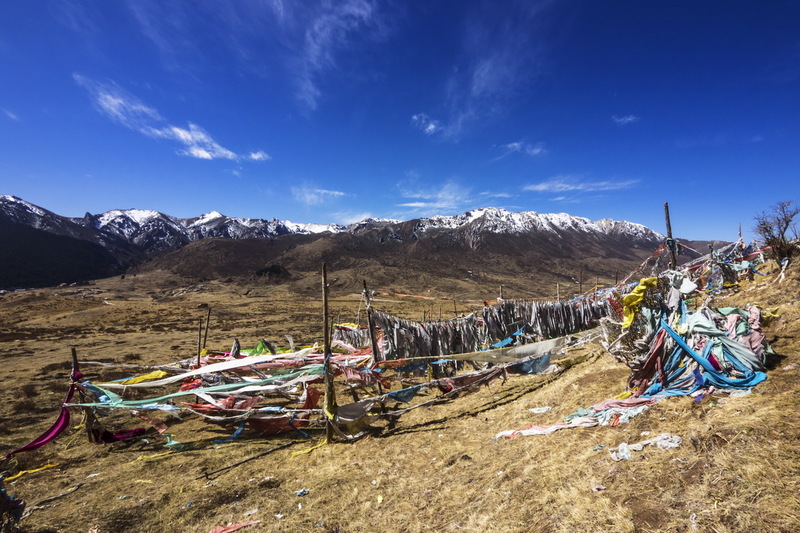 Tibetan Sky Burial… My Chinese friend Jun Quan and I had traveled through the Amdo area of the Tibetan Plateau. Arriving in the north-east of Sichuan Province on the border with Gansu Province at the town of Langmusi. We wanted to visit the two well-known Sertri and Kirti Gompa Buddhist monasteries in Langmusi. We spent most of out time at the smaller and more photogenic Sertri Gompa. Just taking it all in when a chance conversation between one of the monks and Jun told us about a Tibetan sky burial ground up in the hills behind the monastery. We set off to look for it as the monk told us that we could go there. Sure enough we were able to drive all the way up into the hills. Right at the top we found a large prayer flag area with a superb backdrop of snow-capped mountains. But as we got out of the car we had no real idea of what we were actually looking for… And so we wandered around looking for clues – or should that be signs of death? We later learned that the custom at Langmusi is that after the vultures have finished with the corpse, what is left is burnt. 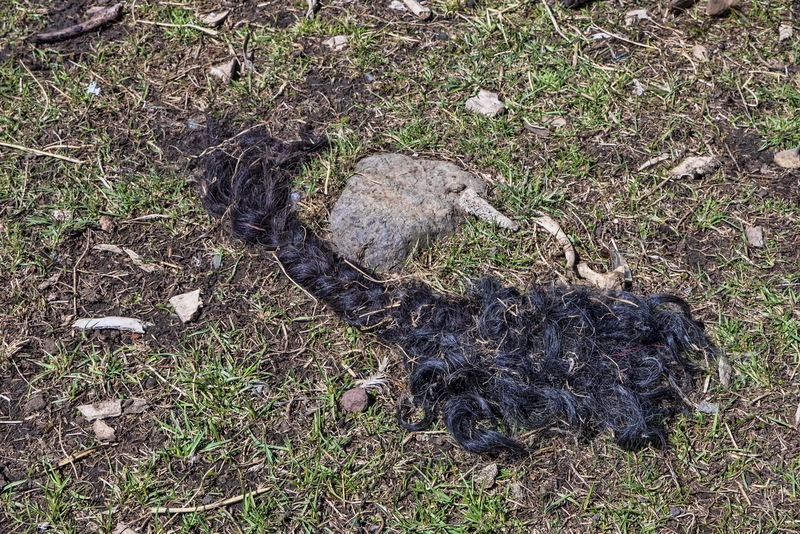 But not all of the bits make it in to the fire and the whole area is littered with remnants such as this head of hair we found nearby. Of course to western sensibilities, with our traditions of treating the dead with great respect and giving them a dignified funeral or cremation, this is all just a little bit too gross… But it needs to be viewed through the prism of Buddhist culture. In that, after death has occurred, the spirit has been released on the journey of reincarnation. So the body is little more than an empty vessel that needs to be disposed of. 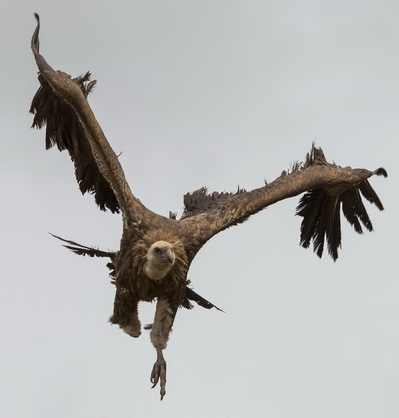 Then consider that high up on the Tibetan Plateau wood is scarce and the ground is too hard to dig holes in… So allowing vultures to dispose of the body in a “sky burial”, and then quickly burning what is left, is considered to be both efficient and cost-effective. 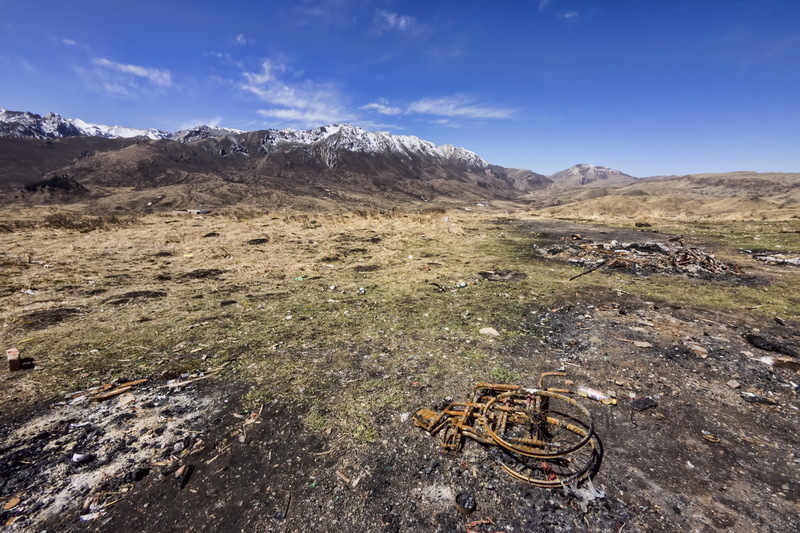 Death on the Tibetan plateau is in fact a very serious and somewhat complicated business. Which is documented in great detail in the Bardo Thodol, more commonly known as the Tibetan Book of Death. The sky burial, or more correctly jhator, which in Tibetan means the giving of alms to birds, is just one element of that ritual. The birds are vultures, the scavengers from the sky which are greatly maligned in the west. But are considered as a kind of angel by Tibetans. Who call them Dakinis (sky dancers) because they take the soul of the deceased to heaven. Buddhist monasteries like the Serti Gompa and Drigung in Tibet perform the more elaborate form of the Tibetan sky burial. Whereas in the remote areas the villagers and nomads simply abandon the dead body. Leaving it to the elements and passing scavengers. In the formal jhator the corpse of the deceased is kept in a sitting position for 24 hours. While the necessary prayers from the Bardo Thodola are recited by a lama. After another two days the body is ready for the next step – which involves offerings and prayers at the monastery from the immediate family. The body is then blessed and washed before being wrapped in white cloth. The spine is then broken so that it can be folded into a smaller bundle… This is so it can be carried to the Tibetan sky burial site, the durtro. Usually by a family member or close friend of the deceased. At dawn on the next day the wrapped body is carried to the durtro, which is always located high up and well away from populated locations. At the durtro, the rogyapa, or burial master, takes over. The grim task of the rogyapa is to prepare the body so that the vultures can consume it – remember this is the giving of alms to the Dakinis. The hair is removed first by scalping the corpse. And then the body is disemboweled so the internal organs can be disposed of separately. 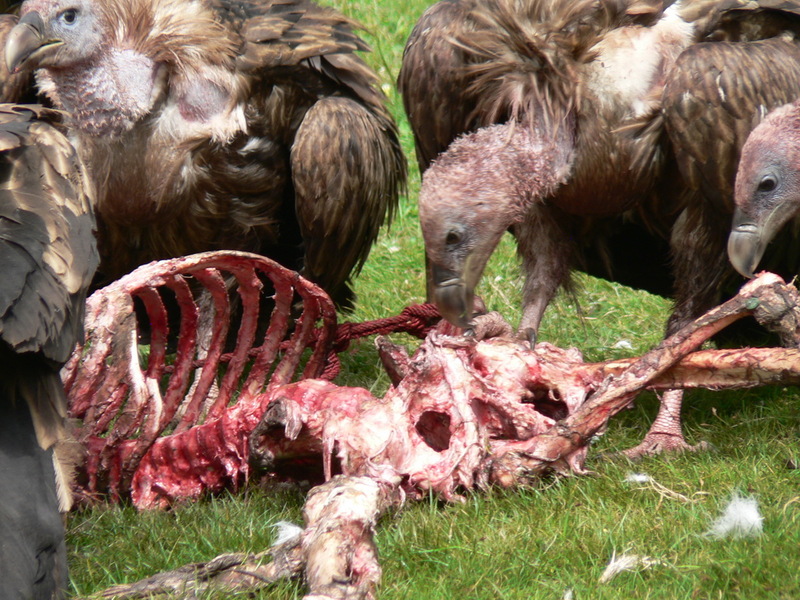 Finally the body is sliced up, the limbs chopped off and the vultures are allowed to start! Members of the immediate family typically avoid the breaking and dismemberment of the body. But Tibetan Buddhists are strongly encouraged to observe jhator so that they can accept the reality of death. And so understand that what matters is the soul as the body is simple the vessel which contains it. 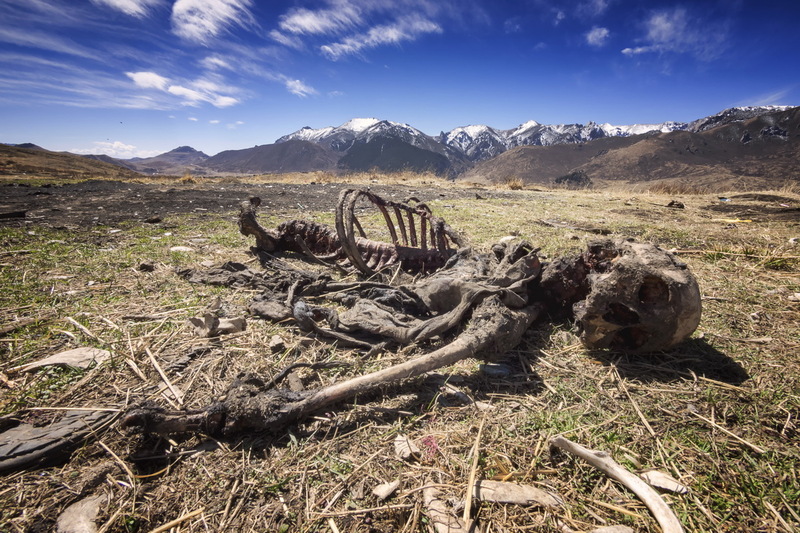 It is not easy to witness an actual Tibetan sky burial as the presence of foreigners is generally not welcomed. Taking photographs at one is considered the height of bad manners… Imagine how you would feel if the paparazzi turned up at a family funeral? But if you want to see more of the real thing take a look at this video of a Tibetan sky burial taken by Marco Mandonnet (www.voyageravecmoi.com) at the Larung Gar Buddhist institute at Serdah in Sichuan province. Hello, I m Marco from “Voyager Avec Moi” thank you to share my work, i m happy you like it. Tibetan Sky Burial is realy amazing life expérience. I know is hard but is Tibetan culture.